We have now crossed the border into Ecuador and the difference was almost immediate. There is much more wealth here than Peru and Bolivia. The houses are much larger and really smart. The landscape is much lusher with lots of green plant and trees. We had a nightmare journey to Baños. Firstly we reached a river and the bridge hadnt been built yet. Then once back on track the police flagged us down to say there had be a landslide and the road was blocked. The trouble is there are not many roads so once there`s a problem one one, it leads to a lengthy diversion. We finally reached Baños in darkness. Baños is right next to a vocano that only in August started throwing out volcanic ash. The town was completely evacuated and has only recently been re-opened to tourists. Its still smoking now so i`m keeping a very close eye on it! Woke up on day one to a bed full of bugs. Changed rooms. 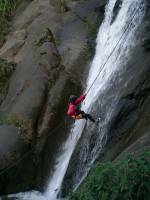 Feeling the need for some adrenalin we signed up for a spot of waterfall canyoning for the afternoon. We were picked up in the back of an open-air truck and taken to get kitted out in probably the most unflattering outfit ive ever seen. Oversized waterproof jacket, vest-style wetsuit, plymsoles, helmet, harness and what can only be described as a big yellow nappy. We got back in the truck, to the delight of the locals and drove to the falls. Fistly we had to jump into the water to get acclimatised. The water was like ice, i couldnt breathe! The first waterfall was a mere 12m high. I was so scared. The instructor talked me through how the mechanism worked and i slowly began edging backwards towards the falls, only looking at my feet and not down. The worst part was tilting yourself over the top to the correct angle. One that was over i began to relax, even posing for photos on the way down. About 6m from the bottom the rope runs out and you have to jump backwards into the Pool below. That was the first one over. The next was a 45m hanging descent. Putting myself over the edge was definately the scariest thing ive ever done. I was shaking! Once that part was over tho the descent was exhillarating. When i reached the bottom i was buzzing and freezing cold and wet. It was such an amazing experience. Played tennis this morning on the hotel`s court. This tour hasn`t been half as `budget`as i expected. This afternoon we decided to hire some quad bikes and go exploring, but on the wayJenny and I found what looked like a Go-Kart with a roll cage, it looked like far more fun so we took that and Gemma and Jess shared a quad. We had to wear a very silly helmet but then we were allowed on the roads to mingle with the everyday traffic. There are no rules here, i love it. The buggy could reach a suprisingly high speed except uphill. At one point we felt like Thelma and louise in our shades and with sarongs wrapped around our shoulders because of the cold. We Explored mountain roads driving through dark tunnels and under waterfalls. It took us a while to realise that Jess and Gemma we`re no longer behind us. We turned around and found the m trying to jump-start the quad. they`d broken down! Cue the Rose and Jenny rescue mission. We decide to head back to the town to get help. With me now behind the wheel and Jen navigating I put my foot down and we headed back, driving right through Baños, out the other side, and getting completely lost. We eventually made it back and sent out the rescue team. This evening we visited the thermal spings for a nice hot, relaxing soak. It was a great way to end a busy couple of days. I began to get very exited about our next stop - The Amazon rainforest, probably the thing i`m looking forward to most. I cant wait.